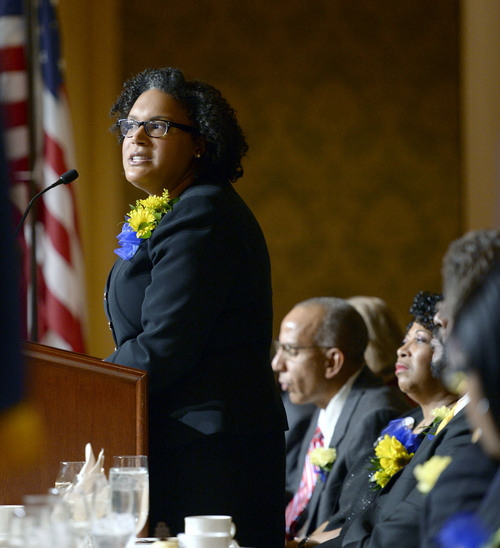 NAACP • Minorities too often arrested, suspended for minor violations, speaker says. 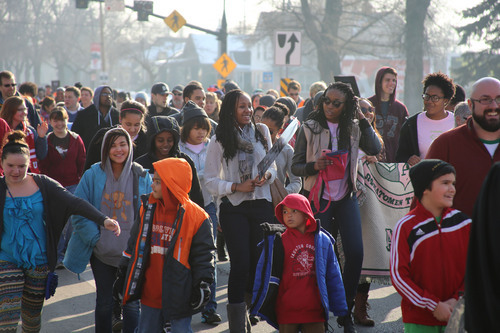 Francisco Kjolseth | The Salt Lake Tribune Sheena Hathorne alongside her daughter Makyla, 10, join University of Utah students and members of the community on the march from East High School to Kingsbury Hall in honor of Martin Luther King Jr. Day. Donations accepted at the end of the March for Youth went to the Rev. 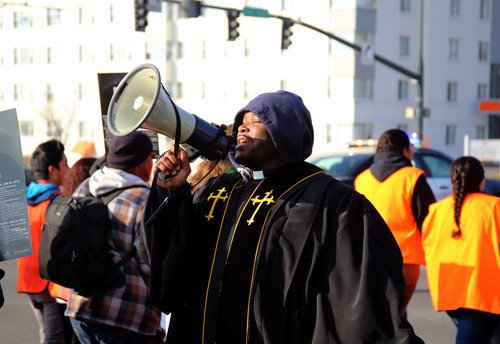 France Davis Scholarship Fund for African-American students.. Francisco Kjolseth | The Salt Lake Tribune Pastor Jerrod Lowry gets the crowd chanting before a 1.3-mile march from East High School to Kingsbury Hall. Al Hartmann | The Salt Lake Tribune Monique Lin-Luse, special counsel for the education group of the NAACP Legal Defense and Educational Fund, speaks at the Martin Luther King Jr. Memorial Luncheon hosted by NAACP at the Grand America Monday. 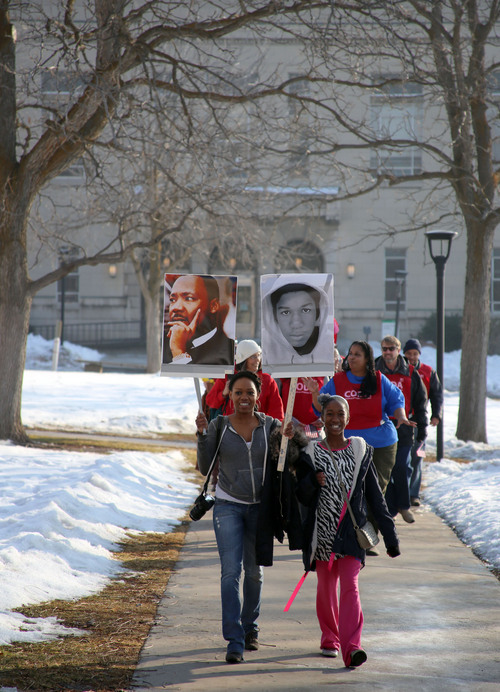 Francisco Kjolseth | The Salt Lake Tribune University of Utah students and members of the community march 1.3 miles from East High School to Kingsbury Hall in honor of Martin Luther King Jr. Day. Donations accepted at the end of the March for Youth went to the Rev. France Davis Scholarship Fund for African-American students. 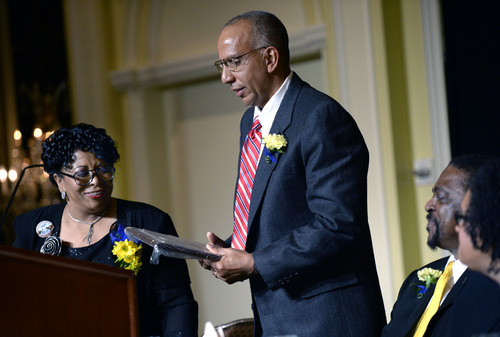 Al Hartmann | The Salt Lake Tribune Jeanetta Williams, president of the NAACP Salt Lake Branch, left, presents the Dr. Martin Luther King Jr. Award to Dr. Michael J, McFarland, associate professor of Civil and Environmental Engineering at Utah State University, at the Martin Luther King Jr. Award Luncheon at the Grand America Monday. Al Hartmann | The Salt Lake Tribune Monique Lin-Luse, special counsel for the education group of the NAACP Legal Defense and Educational Fund, speaks at the Martin Luther King Jr. Memorial Luncheon hosted by NAACP at the Grand America Monday. 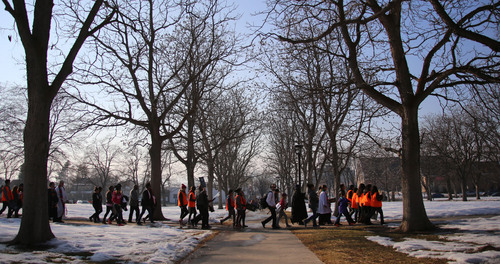 Francisco Kjolseth | The Salt Lake Tribune University of Utah students and members of the community march 1.3 miles from East High School to Kingsbury Hall in honor of MLK day. Donations accepted at the end of the March for Youth go toward the Rev. France Davis Scholarship Fund. Al Hartmann | The Salt Lake Tribune Monique Lin-Luse, special counsel for the education group of the NAACP Legal Defense and Educational Fund, speaks at the Martin Luther King Jr. Memorial Luncheon hosted by NAACP at the Grand America Monday January 20. 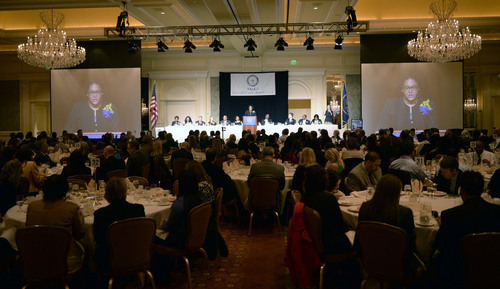 Al Hartmann | The Salt Lake Tribune Monique Lin-Luse, special counsel for the education group of the NAACP Legal Defense and Educational Fund, center, speaks at the Martin Luther King Jr. Memorial Luncheon hosted by NAACP at the Grand America Hotel Monday. 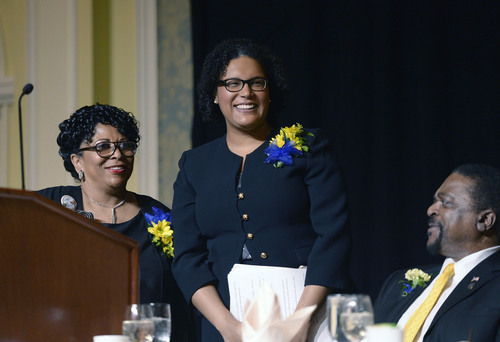 Jeanetta Williams, president of the NAACP Salt Lake Branch, left. Edward L. Lewis, chairman, luncheon, right. 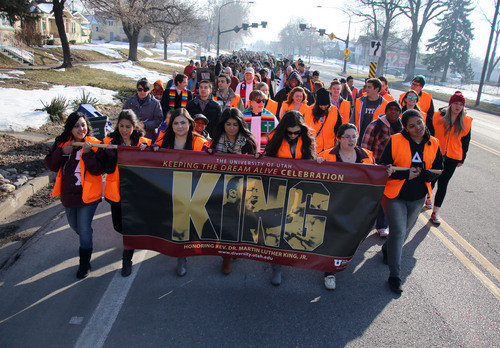 Francisco Kjolseth | The Salt Lake Tribune University of Utah students and members of the community march 1.3 miles from East High School to Kingsbury Hall in honor of Martin Luther King, Jr. day. Donations accepted at the end of the March for Youth go toward the Rev. France Davis Scholarship Fund. Martin Luther King Jr. Day can do more than commemorate a great man. It can also act as a rallying cry for needs still unmet, said NAACP attorney Monique Lin-Luse Monday. She asked a Martin Luther King Jr. Day luncheon audience at the Grand America Hotel to take on "one of the greatest civil rights challenges today." Too many students, especially African-Americans, are being suspended, expelled and arrested for relatively minor offenses, making them more likely to become disaffected, drop out of school and end up in prison, said Lin-Luse who is the special counsel for the Education Group of the NAACP&apos;s Legal Defense and Educational Fund, Inc.
"The narrative can no longer be that ... some kids are lost. Every child starts the first day of kindergarten excited about being in school, excited about what they&apos;re going to be when they grow up," she said. "The future of our country&apos;s economy depends on dismantling the school-to-prison pipeline." African-American student are three times more likely than their white peers to be suspended or expelled, and 50 percent of the arrest referrals from schools are for black or Latino students, she said. Such punishments start at a young age  preschoolers are being expelled at three times the rate of kindergarten through 12th grade students. "People think the kids must be bad," Lin-Luse said. "It&apos;s just not true." About 95 percent of the infractions that result in suspension or expulsion are for non-violent offenses like disrupting class or talking back to a teacher. Once those kids are out of school, she said, they get behind on their classwork and aren&apos;t always supervised, putting them further off-track with more dangerous behavior that could end in a prison sentence rather than college or a job. But there are solutions. Schools can become safer and have fewer drop-outs if they do things like focus on instructive disciple rather than sending kids out of school, and refer them to guidance counselors rather than police. "We know what works. The question is, do we have the will to make the changes necessary?" she said. Utah Supreme Court justice Christine Durham, winner of the 2014 Rosa Parks Award, called Lin-Luse&apos;s remarks "dead on." 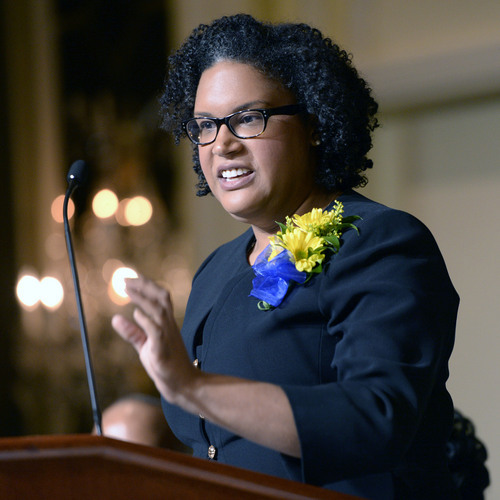 "It&apos;s a precursor to what we refer to in the criminal justice system as mass incarceration, which disproportionately affects ethnic and racial minorities," she said. "It is a scandal that in the United States of America such a status should prevail." Also talking about education on a day that saw several students get scholarships from the NAACP&apos;s Salt Lake City Branch was Utah State University associate engineering professor Michael McFarland, who said discrepancies in learning don&apos;t end with the K-12 school system. Winner of the Dr. Martin Luther King Jr. Civil Rights Award, McFarland said there&apos;s a shortage of women and minority students in science and technology, fields fueling the future economy. "Women and minorities feel alienated in our program," he said. "What I believe is all of you have a responsibility as state taxpayers. Your money should be spent on providing opportunities to all people ... to lead this state and this country in the creation of new jobs, especially high-tech jobs, that will keep this country competitive." Glory Stanton, a 20-year-old student at both Salt Lake Community College and the University of Utah, said she chose pre-medicine as a major after meeting a number of mentors and role models through her mother&apos;s community involvement. "It&apos;s not easy," Stanton said. "Seeing them in that field, it made it something I saw as attainable."